Be thankful for our bounty. 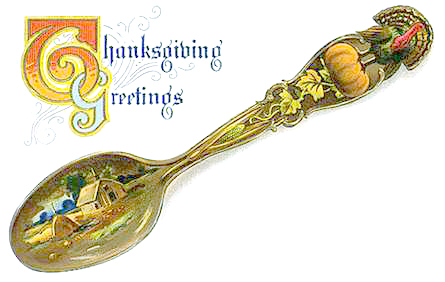 I’m back to blogging and I am looking forward to writing about Thanksgiving and sharing recipes and decorating ideas with you. The first Thanksgiving must have been incredible. Just think, two or more distinct cultures gathered together to share food, to break bread as we say. They got together in peace and friendship and each to thank their creator in their own separate way. Of course, there was talking, although few knew the language of the other, I assume, but they managed to communicate. Just picture what it must have been like, celebrating the harvest, and survival in a new land with a new culture that was willing to teach what they knew about the land, if only we had listened! 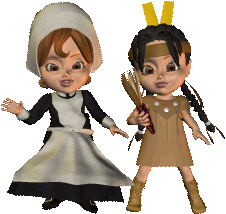 If only we had more respect for the Native Americans; and not only the Native Americans but for others who shared our experience but believed differently than we did. What a unique and tremendous opportunity we were offered and we blew it. But, that is a discussion in of itself and I want to talk about the positive. 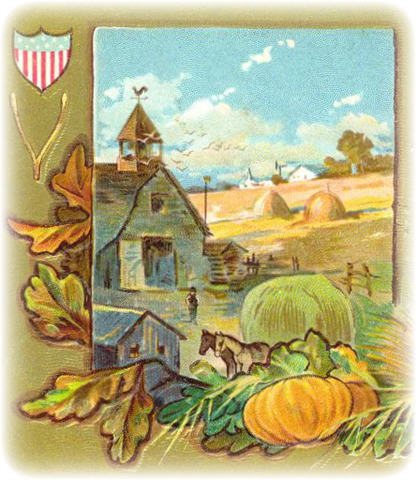 Thanksgiving celebrates the harvest, for which, especially as Americans, we have much to be thankful for. 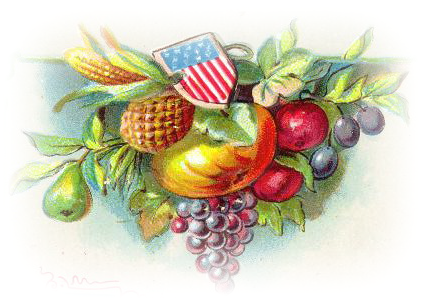 We have a beautiful, bountiful country that produces a variety of crops. We have apples of different varieties , corn, tomatoes, lettuce, cabbage, zucchini, pumpkins, squashes of all kinds, orange, grapefruit, tangerines, beans, horseradish, parsley, onions, garlic, wheat, buckwheat, oats, sugarcane, peaches, berries of all kinds, and more and that’s just to eat. To cover our bodies we have cotton and probably other crops I am unaware of. To beautify our homes we have flowers of all colors, shapes and sizes. We have trees for shade and for building our homes. The United States was truly a land of plenty. Thanksgiving celebrates our relationships with family and friends and brings them together at the table for what could be a really unique experience as we relate what we are thankful for with the people who are most important to us. And most thanksgiving celebrations bring people together to offer prayers to their creator in an inclusive manner. We can even sing the songs we learned when we were young, and can learn new songs from those that are younger than we are. So, we celebrate music also. We celebrate our beloved country and thank all the service men and women who help keep us from harms way and we thank our veterans too. We pray that our president(s) lead wisely and make decisions based on the values of our country. We thank our creator for the freedoms we Americans enjoy and pray that we will always have those freedoms. And, if you are like me, I also celebrate the Internet for bringing me friends I would have probably never have met otherwise, and for bringing me knowledge that I wouldn’t have without it. And for those of you who are lucky enough to have paying jobs, you must also be thankful for that. And for those who are lucky enough to have children no matter if they are your natural offspring, adopted or step-children, you are truly blessed. Be thankful that you were chosen to propagate our world. And if you have grandchildren, you are blessed even more. Be thankful. If you have no children of your own but have nieces and nephews, or a neighbor’s child who looks up to you, be thankful. I thought that to celebrate Thanksgiving, I would do a different meal course each day, so today I will post some appetizer and some beverage recipes. An elegant appetizer to serve for Thanksgiving. 1. Refrigerate Brie until chilled and firm; or freeze 30 minutes, or until firm. Cut Brie in half horizontally. 2. Combine butter, cherries, pecans and thyme in a small bowl; mix well. Evenly spread mixture on cut-side of one piece of the Brie. Top with the other piece, cut-side down. Lightly press together. Wrap in plastic wrap; refrigerate 1 to 2 hours. To serve, cut into serving size wedges and bring to room temperature. Serve with crackers. Makes about 20 appetizer servings. Note: If wrapped securely in plastic wrap, this appetizer will keep in the refrigerator for at least a week. SOFTA123’S NOTE: I would also serve the Brie Torte with apple and pear slices. I would make it right after you put your turkey up to roast. Or, I see no reason why you couldn’t make it the night before. 1. To make the mayonnaise, beat the egg yolks in a medium bowl with an electric mixer or hand blender. Slowly blend in the oil, one tablespoon at a time while mixing constantly. Continue to add oil until the consistency is a little thicker than regular mayonnaise. Pierce the garlic clove, and stir it around in the mixture until it releases its juice. Remove the garlic and season with salt and pepper. Mix in the red wine vinegar 1 teaspoon at a time. Go slow, this will thin the mayonnaise a bit. Place the eggs in a large pot with enough water to cover. Bring to a boil, then simmer for 10 minutes. Remove from the heat, drain and cool. Peel off the shells, and cut eggs in half lengthwise. Remove the yolks, and place them into a medium bowl. Place the egg whites on a serving plate. To the yolks, add shallot, salmon, 1/2 cup of the mayonnaise, salt and pepper. Mix until well blended. If the mixture seems dry, stir in more mayonnaise. Spoon into the egg white halves and chill or serve. Mash garlic to a paste with salt and pepper, using a mortar and pestle. Whip the paste together with lemon juice and olive oil. Toss with chickpeas and mash chickpeas with a fork, leaving some chickpeas formed for texture if you like. Just before serving, stir in mint. Serve on crostini. Can be mashed and chilled one day ahead, but bring to room temperature and add mint just before serving. Mix sugar pepper vodka and rub over salmon, top with chopped dill. Cover with plastic wrap and put in refrigerator for 2-3 days. If you make it today, it will be ready. Serve on pareve toast points with capers, chopped egg etc. Now let’s have something to help wash these delicious appetizer recipes down. The alcoholic recipes will be first and the non-alcoholic recipes will follow those. Core and halve apples, arrange (cut side up) in pan. Sprinkle with brown sugar and bake in preheated oven for 20 minutes or until tender. Just before serving, pour cider in saucepan and heat to just below boiling point. Stir in remaining ingredients over low heat until sugar is dissolved. Remove lemon slices. Pour mixture into punch bowl. Garnish with apple halves. A toast to you and yours for a Happy, Healthy Thanksgiving! In a small saucepan, combine honey, lime juice and mint. Warm over low heat until honey is thin. Remove from heat and cool for 5 minutes; discard mint. Place raspberries, blackberries, strawberries and cherries in a large bowl. Pour honey mixture over berries and stir gently to combine. Divide among serving glasses and refrigerate until served. Pour champagne over fruit and serve. Makes 8 servings. 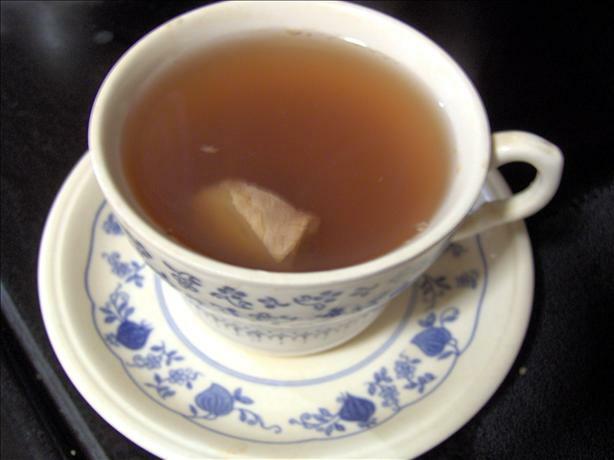 This tea is also good for colds and sore throats! In a saucepan, simmer ginger, honey, cinnamon, and water for 20 minutes. Simmer longer for stronger tea. 2 Add honey or sugar and srain tea through a sieve. A colorful punch to serve for festive occasions. Place filter in brew basket of coffee maker. Add ground coffee and cinnamon. Pour syrup into empty coffee pot. Add water to coffee maker; brew. After brewing is complete, stir coffee well. Pour coffee into 6 coffee mugs. Top with a dollop of whipped cream or Cool whip. Lightly sprinkle ground cinnamon on top. In punch bowl, combine juices, lemonade, sugar and food coloring, if desired. Add ginger ale just before serving. Float orange slices on top. The holiday of Sukkot begins on the 15th day of the month of Tishrei. Known in rabbinic literature as Ha-Chag–“the holiday”–the themes of Sukkot are clearly of high importance in Jewish theology. Sadly, many Jews, including myself, really don’t celebrate it. Perhaps we have a festive meal and perhaps we are lucky enough to be invited to eat dinner in a sukkah (open air booth) built by a friend or family member. Or perhaps our synagogue has a communal meal to celebrate that we can take part in. In part it is the fault of our school system here in the U.S. In part it is the fault of today’s world. And in part, it is the fault of our parents and/or of us. We have to take so much time off for Rosh Hashanah and Yom Kippur that we tell ourselves (and it is probably not far from the truth) that we will be fired if we take too much time off from our jobs, even if it is for religious reasons. At one time employers may have been more sympathetic to our needs, but not any longer. Our children are allowed to miss only so many days a year and here in the North that means we have to plan missed snow days. Don’t forget that kids get sick, especially during the winter, as we adults also do. Doctor appointments, dental appointments, “tummy ache” days, they all add up. So how can we allow our children to take time off? Even if we did insist they take the time off, how are they ever going to catch back up with the other kids, let alone bypass them in the race for college scholarships, let alone college admittance? So our observance of Sukkot, the most beautiful of our holidays, and one of the most important of our holidays takes a back burner to the secular world and our secular lives. I am glad to say that more and more people that I know do take the time to build their own personal sukkahs and take the time to celebrate. Last year Paul and I were invited to our Cousin Susan’s sukkah along with many other people. Susan is the hostess with the moistest and her sukkah and sukkah party were no exception. This year we have been invited to our good friends’ The Sterns, sukkah for an intimate family dinner. We are hoping that the weather will be with us so we can at least do the ceremonial part of the meal in the sukkah, if not have our entire meal out there beneath the stars. I know in Kingston, my step-son-in-law and grandson are helping to build their synagogue’s sukkah and will be celebrating there with the temple family. My mom will be going to my Aunt’s house or my cousin’s house. The symbolism of the sukkah is a strong reminder of the dwellings of the biblical Israelites as they wandered in the desert for 40 years after the exodus from Egypt. In this manner, these temporary dwellings return us to a different time in our development and remind us of our journey to nationhood. That answers the question “is Judaism” a nation? Yes, in part it is. Another symbolic definition of the sukkah is that it binds us to G-d as we recall our dependence on him for our daily needs and we celebrate all that he does for us. We are commanded to be joyous during the whole holiday period (7 days) of Sukkot. We are told that it is a worse sin to be sad during this period than to have a sip of water on Yom Kippur. I had no idea until I started writing this article of just how important Sukkot is in Judaism. People take great pride in decorating their sukkah, but it is always decorated with fruits and greenery to remind us that Sukkot is a harvest holiday. 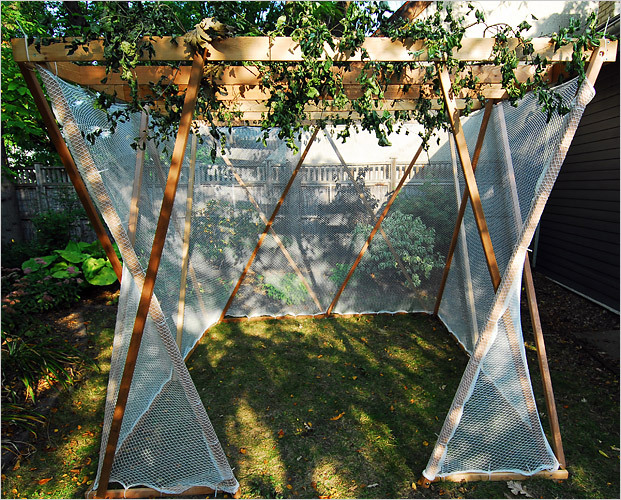 I went rummaging through the Net to find some pictures of the coolest sukkahs. Here are some I think gives you an idea of the different types of sukkahs you can find. 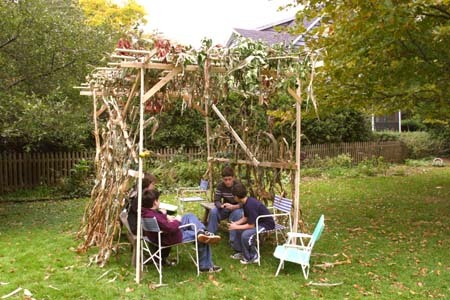 This is a very basic sukkah. I found it at the Mont Clair Jewish Organization’s website. This picture is of a pre-fab sukkah that you can purchase. I found this picture at Tzvee’s Talmudic Blog. 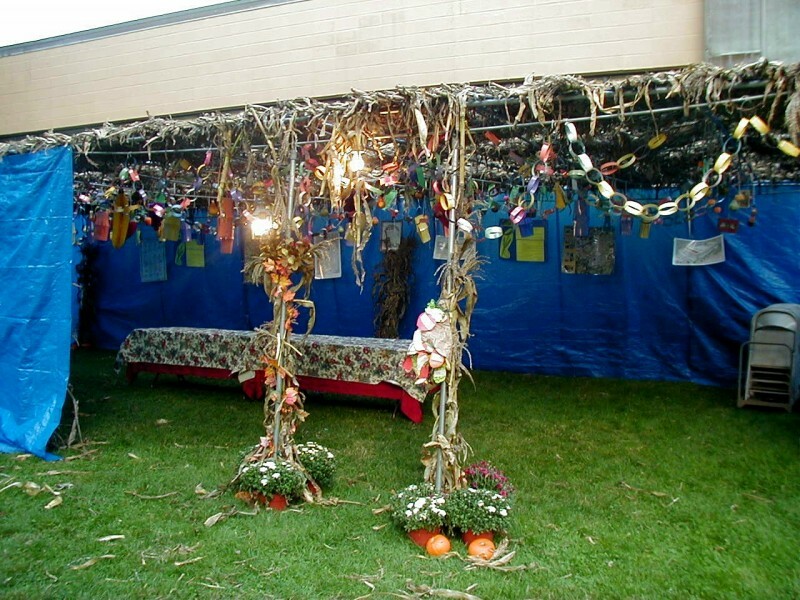 This is a great example of a sukkah decorated with fruits and greens. Click on the photo to go to HWPS Organization’s website. There are other themes but my typing time is running out and I do want to share a Succot Menu and recipes with you. For more information, click on the footnote and read the article where I found most of my information. This menu is for a buffet meal. 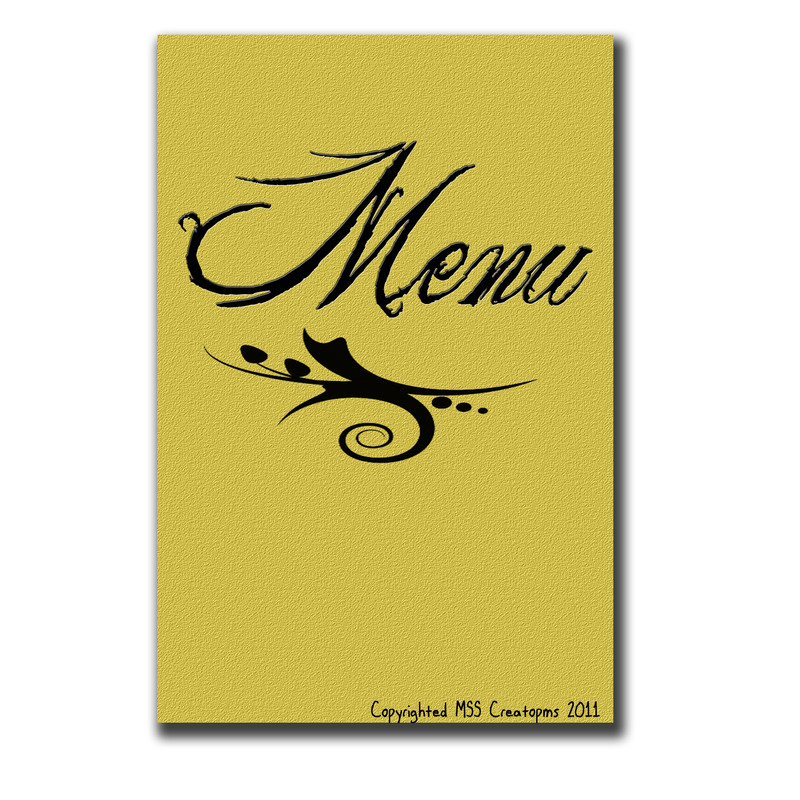 The recipes are included for menu items that have an asterisk at the end of the name of the item. DISCLAIMER: The only photos that look like the recipes they go with are the Mandel Bread and the Russian Tea Cookies and the mini cupcakes. Where I could, for the graphics, I attached links to them. Mix salmon & liquid, small onion, small carrot, 2 eggs, matzah meal, salt, pepper and dash of nutmeg together and allow to set for 10 mins. With WET hands, form into small balls (golf size balls), roll in crumbs and fry quickly. Drain on paper towels. Mix together all sauce ingredients. Pour sauce into GREASED baking pan. Place patties on sauce and heat in 350 degree oven UNCOVERED for 20-30 mins. Cook noodles in boiling salted water 25-30 minutes. Strain and rinse with cold water. Add butter to noodles and mix until melted. Add sugar,eggs, cinnamon, fruits, juices and raisins. Mix gently. Pour intogreased 9 x 13 x 2 inch Pyrex dish. Bake at 325 degrees for 1 1/2 to 2hours, depending upon crustiness desired. Serve warm or cold. Softa123’s aka Marilyn’s Note: I have not tried this recipe yet, but I think it sounds perfect for Sukkot as it features pears in addition to the normal apples and raisins. Also, what is nice about this recipe is that it is parve, so it can be eaten with either a dairy or a meat meal. Line two 15-in. x 10-in. x 1-in. baking pans with foil. Place all vegetables (except onions) in a zip lock back with the oil, salt and pepper. Shake the bag to make sure everything is coated and let sit for 5 minutes. Place eggplant and mushrooms on a pan. Place the zucchini on the second pan. Bake, uncovered, at 400 degrees F for 15 minutes. Turn vegetables over. Bake 15 minutes longer. Remove eggplant, onions and mushrooms. Bake zucchini 5-10 minutes longer or until edges are browned. Sauté onion in a skillet with olive oil. Add in the tomatoes and spaghetti sauce. Let sit for about 5 minutes. In a bowl, combine the ricotta cheese, Parmesan cheese and egg substitute. Spread about 1/4 cup pasta sauce in a 13-in. x 9-in. x 2-in. baking dish coated with nonstick cooking spray. Layer with four lasagna noodles (noodles will overlap slightly), half of ricotta cheese mixture, half of vegetables, a third of pasta sauce and 2/3 cup mozzarella cheese. Sprinkle with half of basil. Repeat layers. Top with the remaining noodles and pasta sauce. Cover and bake at 350 degrees F for 40 minutes. Uncover; sprinkle with remaining cheese. Bake 5-10 minutes longer or until edges are bubblyand cheese is melted. Let stand for 10 minutes before cutting. 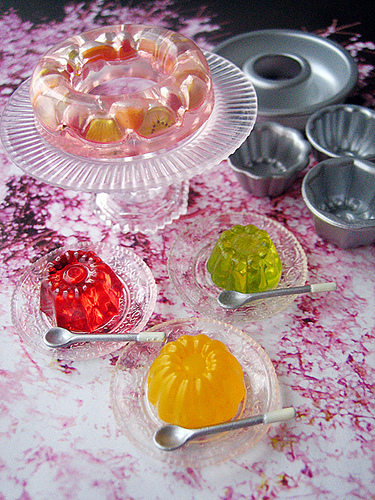 Dissolve gelatin in hot water; chill until partially set. Fold in cottage cheese, whipped cream, walnuts, cherries, and pineapple. Pour into pan and chill until firm. Cut in squares and serve on lettuce. 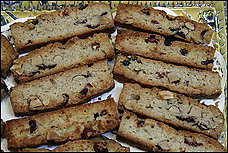 “Many cultures and cuisines have their own version of this crisp bread that is eaten as a cookie. Dotty Fuchsman says her husband’s is “world famous” because they have taken it to England and Israel. Preheat the oven to 350 degrees. Lightly grease a large rimmed baking sheet with canola oil or nonstick cooking oil spray. Combine the bread flour, cornmeal, sugar, salt, baking powder, cinnamon, almonds and dried cranberries or raisins in a large bowl. Combine the egg whites, egg and oil in a separate bowl; blend well. Add the almond and vanilla extracts, water and citrus juice. Add to the bowl of dry ingredients; mix and knead the dough until it achieves the consistency of putty. Divide the dough into 4 equal portions and form them into bars on the baking sheet, roughly 3 inches by 12 inches by 3/4 inches thick, spaced apart so they do not touch. Bake for about 20 minutes, and then transfer the pan to a wire rack to cool for about 10 minutes; the bars will be warm and slightly set. Meanwhile, position an oven rack 4 to 5 inches from the top broiling element and preheat the broiler. Have ready 2 large, same-size baking sheets. Use a very sharp knife to cut the bars into 1/2-inch or 3/4-inch slices; there should be about 16 to 25 slices per bar. Working in batches, lay the bars flat on a baking sheet (about 36 should fit snugly on 1 sheet) and sprinkle with the cinnamon-sugar mixture. Toast under the broiler for 5 to 8 minutes or until the edges are brown and the sugar has melted. Remove from the oven and carefully place a second baking sheet on top of the toasted slices. Use oven mitts to hold the sheets together and carefully flip over; remove the top baking sheet so that the untoasted second sides of the slices are exposed. Sprinkle with the cinnamon-sugar mixture and return to broil for 5 to 8 minutes. Transfer the slices to a wire rack to cool thoroughly; the slices should be crisp. From Annandale resident Al Fuchsman. 66 calories, 3g fat, 0g saturated fat, 2mg cholesterol, 35mg sodium, 8g carbohydrates, 0g dietary fiber, n/a sugar, 1g protein. I love brownies...all kinds of brownies! Combine the melted margarine, cocoa, and the sugar. Add the six beaten eggs. Mix together the flour, salt and baking powder and add to other mixture. Add the vanilla and broken walnuts. Russian Tea Cookies...Yummy in my tummy! Cream shortening, margarine and sugar. Add vanilla extract, flour and nuts. Form little balls of dough with teaspoon of batter. Place on UNGREASED cookie sheets. Bake 30 minutes at 300 degrees. After cooling for 15 minutes, roll balls in confectionery sugar. I have to try this recipe, don't you? Mix both ingredients together thoroughly and fill mini cupcake liners almost to the top. These cupcakes will not rise that much and will not shape naturally. Bake at 350 degrees for 12-15 minutes, checking with the toothpick test. Whip the butter on medium-high speed for 5 minutes, scraping the bowl when necessary. Reduce the speed to low and gradually add the powdered sugar. Once all of the powdered sugar is incorporated, increase the speed to medium-high and add the vanilla, honey, and cinnamon mixing until incorporated. Add the melted cinnamon chips and whip at medium-high speed until light and fluffy, about 2 minutes, scraping the bowl as needed. Then, ice the cupcakes! 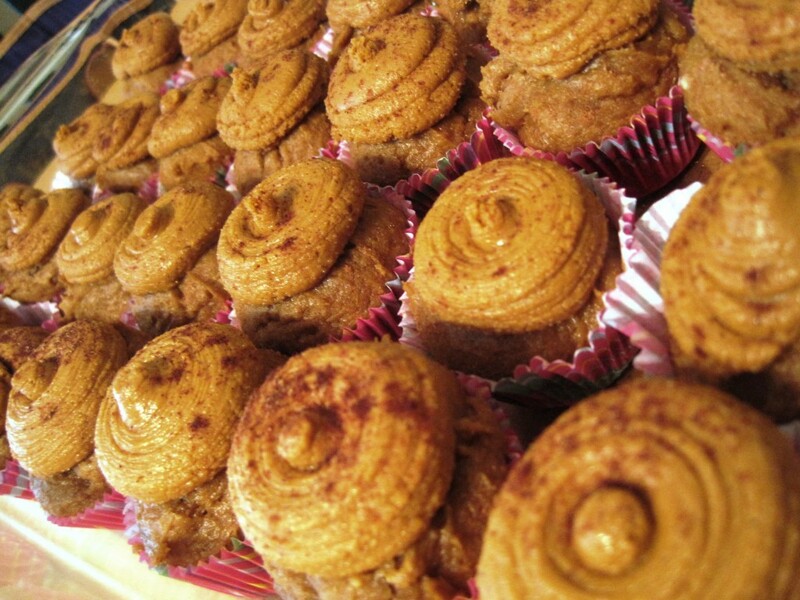 Sprinkle with cinnamon or pumpkin pie spice. NOTE FROM SOFTA123: I apologize for not posting this article sooner but real life interrupted. I hope that this will not happen again, but I know better than to say never! Since I named this blog ATzimess, I thought it would be a nice “home” warming gift to all of you if I posted my favorite Tzimmes recipe. This is my Grandmother’s recipe and the only one I really enjoy. It is not a sweet Tzimmes, but a savory one. I have never heard of anyone else making this type of Tzimmes. Try it, you may like it! Grate 4 potatoes, with 1 onion. Drain. Add egg, flour (or Matzah Meal), oil, salt & pepper to taste. disposable aluminum pan) and bake at 350 degrees for 1/2 hour. 9x13 inch pan and put in just enough water to barely cover. 15 minutes or until the kugel is done, but not brown on top. Take the Tzimmes out of the oven and pour mixture into a large bowl. Mash everything together with potato masher.